↑ Black, Jeremy (2002). Warfare In The Eighteenth Century. Cassell. ISBN 0304362123. ↑ ४.० ४.१ ४.२ Roy, Kaushik. India's Historic Battles: From Alexander the Great to Kargil. Permanent Black, India. pp. 80–81. ISBN 978-8178241098. ↑ Chandra, Satish (2004). "Later Mughals". Medieval India: From Sultanate to the Mughals Part II. 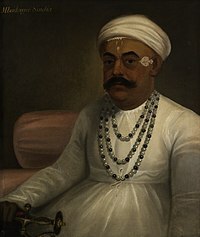 Har-Anand. ISBN 81-241-1066-2. ↑ James Rapson, Edward; Wolseley Haig; Richard Burn; Henry Dodwell; Robert Eric Mortimer Wheeler (1937). The Cambridge History of India: The Mughul period, planned by W. Haig. 4. Cambridge University Press. p. 448. ↑ "250 years on, Battle of Panipat revisited". Rediff.com. 13 January 2011. Retrieved 26 March 2012. ↑ Roy, Kaushik (2004). India's Historic Battles: From Alexander the Great to Kargil. Orient Blackswan. p. 91. ISBN 978-8-17824-109-8. https://books.google.com/books?id=jpXijlqeRpIC&pg=PA80. ↑ १२.० १२.१ १२.२ १२.३ Rawlinson, H. G.. Cambridge History of India. IV. p. 424 and n..
↑ १३.० १३.१ Barua, Pradeep (1994). "Military Developments in India, 1750–1850". Journal of Military History 58 (4): 616. doi:10.2307/2944270. JSTOR 2944270. ↑ Sarkar, Jadunath (1950). Fall of the Mughal Empire. Longmans. p. 235. ↑ १५.० १५.१ Mohsini, Haroon. 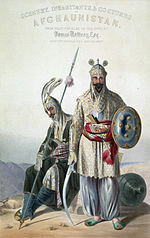 "Invasions of Ahmad Shah Abdali". afghan-network.net. Archived from the original on 13 August 2007. Retrieved 13 August 2007. ↑ MacLeod, John (2002). The History of India. Greenwood Press. ↑ "The lost Marathas of third battle of Panipat", India Today, 2012-01-12. Retrieved on 2017-04-05. ↑ Rao, S. "Walking the streets of Panipat". Indian Oil News. Archived from the original on 28 April 2008. Retrieved 8 April 2008. Uday S. Kulkarni, A Non Fiction book – 'Solstice at Panipat – 14 January 1761' Mula-Mutha Publishers, Pune (2011). फलकम्:ISBN An Authentic Account of the Campaign of Panipat.